Coaches, players and families out in force at Sinatra Park Soccer Field to support the young Barça players and get the chance to interact with them, while director Xavier Vilajoana speaks to them about the value of being taught the Barça methodology. Barça has once again shown why it’s more than a club. The small stands at Sinatra Park Soccer Field, venue for the 2018 edition of LaLiga Promises Internacional, were packed with Barça and Catalan flags every time the U12A team was in action. The coaches, players and families of Barça Academy Pro NY made their presence felt in style. They got behind Marc Serra’s side all the way, and once the game with New York City, which ended 0-0, was over, the players showed their appreciation. 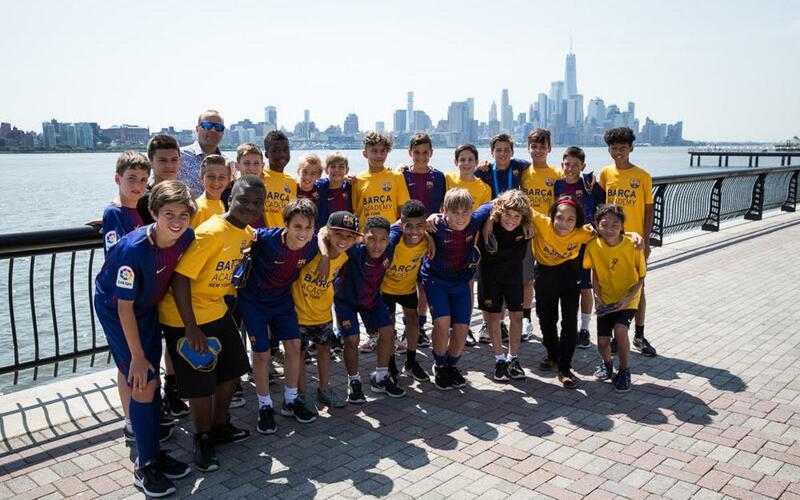 The FC Barcelona U12A team and the players from Barça Academy Pro NY exchanged greetings with the New York skyline as testimony in the background. Barça pennants were handed over as gifts and the youngsters were able to tell their American friends just what it’s like to be part of the Barça academy. It’s been an experience that they’ve all thoroughly appreciated. Joseph, a young lad who got to see Barcelona thanks to the International Tournament at Easter, told them how he plays in defense and loves the attacking philosophy that typifies the Barça style. Thanks to his hair, Joseph looks like a smaller and American version of Xavi Simons, who he got to know in person a few months ago when he appeared at the Easter tournament. Eaden Jarvis is another player who loved today’s experience, and who also traveled to Barcelona for the International Tournament. This Sunday he will be competing with his U12 team in the finals of the NY State Cup. Today they all got the chance to meet and also to enjoy listening together to the words of the director responsible for amateur youth soccer Xavier Vilajoana, who’s attending the tournament in New York, who told them about the importance of “being trained in a soccer model that’s based on ball possession and controlling games, just like the boys at la Masia learn”.